The Heart of Perfect Wisdom Sutra or Heart Sutra (Sanskrit: प्रज्ञापारमिताहृदयसूत्रम् Prajñāpāramitā Hridaya Sūtra; Chinese: 般若波羅蜜多心經, Buorebuoluomituo Xinjing; Japanese: Hannya Shingyo) is a well known Mahāyāna Buddhist sutra. The Heart Sutra comes from the third of Edward Conze’s four periods in the development of the Perfection of Wisdom literature. It is a very much contracted presentation of the ideas of the perfection of wisdom tradition which had ballooned up to 100,000 lines. Along with the Diamond Sutra the Heart Sutra is the main representative of this period, although because it contains a mantra (sometimes erroneously called a dharani) it does overlap with the last, tantric phase of development. The study of the Heart Sutra is particularly emphasized in East Asian Buddhism. Its Chinese version is frequently chanted (in the local pronunciation) by the Zen sects during ceremonies in China, Japan, Korea, and Vietnam. It is also significant to the Shingon Buddhist school in Japan, whose founder Kukai wrote a commentary on it; and to the various Tibetan Buddhist schools. 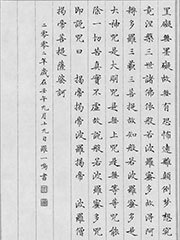 Some scholars believe that the Heart Sutra was originally composed in China and only later translated into Sanskrit. However this appears to be a minority position; most hold that the Sanskrit is the original, even though the Chinese version has undoubtedly been more influential. Various commentators divide this text in different numbers of sections. Briefly the sutra introduces the bodhisattva of compassion Avalokiteśvara who in this case is representing the faculty of prajña (wisdom). His analysis of phenomena is that there is nothing which lies outside the five aggregates of human existence (skandhas) — form (rūpa), feeling (vedanā), volitions (samskārā), perceptions (sa.mjñā), and consciousness (vijñāna). Avalokiteśvara then addresses Śariputra, who in this text is a representative of the Early Buddhist Wisdom schools. The bodhisattva famously states «form is emptiness, emptiness is form» and declares the skandhas to be equally empty — that is, to be without an essence which is independent of the five skandhas. Avalokiteśvara then goes through some of the most fundamental Buddhist teachings, and explains that they are simply statements about reality, they are not reality itself, and that they are therefore not true in the highest sense. In other words the Buddhist cannot rely on mere words, or on traditional teachings. The bodhisattva as the archetypal Buddhist relies on the perfection of wisdom, which is the wisdom that perceives things as they are, that perceives reality directly. This perfection of wisdom is condensed in the Heart Sutra mantra. बोधि स्वाहा Bodhi svāhā Enlightenment, how wonderful! A striking feature of the sutra is the fact that the teaching is not actually delivered by the Buddha (sutras supposedly being the category of teachings that were spoken directly by the Buddha); instead, the Buddha restricts himself to confirming, after Śariputra has finished, that his explanation of prajñāpāramitā is correct.